Thanksgiving turkey has a reputation for being a big deal to make. It is big, but it couldn't be easier to roast a fabulous, juicy bird. This recipe builds flavor in layers with a pre-salting process, an herbed butter under the skin, and a stuffing of aromatics. 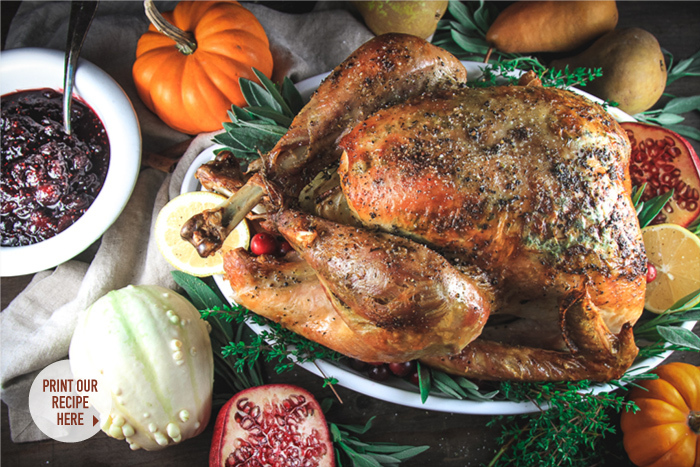 The result is a moist, golden bird with plenty of fall flavors infused throughout. 1. 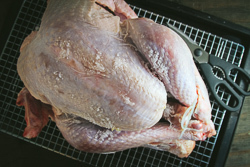 Pre-salt the turkey with a “dry-brine method” 24 hours in advance by removing the turkey giblets, washing the turkey inside and out, and salting the exterior of the turkey with 3 tablespoons of kosher salt. 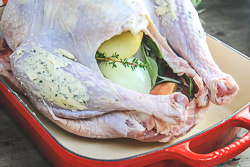 Refrigerate the turkey uncovered, breast side up on a wire rack over a cookie sheet. This will air-out the turkey, and allow the skin to crisp into a perfect golden brown. 2. Once the 24 hours of pre-salting is over, preheat the oven to 350° F.
3. 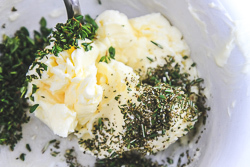 In a bowl, mix the softened butter with the chopped thyme and rosemary. Set aside. 4. 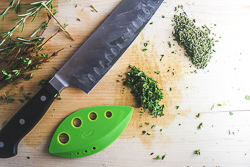 In a small microwavable safe dish, microwave the apple, and onion in the water for 5 minutes, then discard the water. 5. Prepare the turkey. Place the turkey in a large roasting dish. 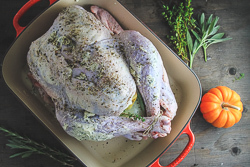 Using your fingers, carefully rub the butter and herb mixture underneath the turkey skin directly on the breast. Be sure to not pierce the skin, but try to get the breasts fully coated with the butter mixture. Apply any excess butter on the outside of the turkey legs and wings. 6. 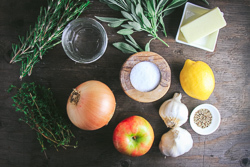 Stuff the turkey cavity with the heated apple slices and onion, along with the sprigs of thyme and sage, and the garlic clove halves. Drizzle the lemon juice on top of the turkey. 7. Tie the turkey legs together with string and tuck the wing tips underneath the body of the turkey. Pepper the turkey all over. 8. Cover the turkey loosely with tinfoil. Roast the turkey 2 hours. After 2 hours, increase the heat to 450°F for 15-20 more minutes in order to get the skin crispy. 9. 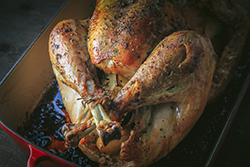 With a meat thermometer, check to ensure the thickest part of the turkey is 160°F. 10. Remove the turkey from the oven and let it rest, covered with foil, for about 20 minutes. 11. Carve the turkey and serve. 1. Prepare the gravy. Use a gravy separator to remove the excess fat from the pan drippings. Add additional chicken stock (to make a total of 4 cups of liquid). 2. Meanwhile, in a large skillet or saucepan, make a roux with the flour and butter. Melt the butter and stir in the flour. Whisk together for 2 minutes, to remove the raw flour flavor. 3. Add one cup of the broth, and whisk to combine. 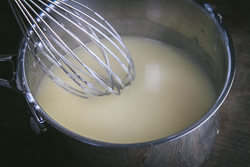 Bring to a simmer, and then slowly add the remaining broth while whisking. 4. Stir continuously until the gravy thickens. Season with salt and pepper to taste. Serve on the side of the turkey and mashed potatoes.